I-X Center lands a big piece of its history » OPShots.net - Cyberhub to Cleveland Aviation and the World! CRAIN’S CLEVELAND BUSINESS – The I-X Center has rescued an aircraft with ties to the massive, World War II-era building and plans to showcase it on the complex’s 1 million-square-foot exhibition floor. The airplane, a KC-97 Stratofreighter flying tanker, is in pieces for now. 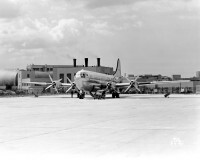 But within a year, with the investment of $1 million-plus, I-X Center executive vice president Bill Perrien hopes to have it put back together and on display at the building, where many of the parts and assemblies of the aerial refueling tanker and its brother, the B-29 Superfortress bomber, were manufactured. Park credits his staff, led by Perrien, with seeking out a plane and planning its future at the exhibition hall. But it fits nicely into his long history of building the Park Corp.
For now, the 117-foot-long fuselage, cut into two pieces for shipping, sits on stands in a corner of the immense main exhibition space at the center, which was built by the federal government in 1942 to manufacture parts and assemble aircraft for the war effort. Two engines, two wings, two fuel tanks, the horizontal stabilizer, tail rudder and tires lay scattered nearby. 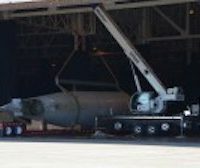 Perrien said he found the aircraft at the U.S. Air Force’s Aerospace Maintenance and Regeneration Center (AMARC) in Tucson, Ariz., a part of Davis-Monthan Air Force Base. It had sat there since 1960, he said. AMARC claims to be the largest aircraft boneyard in the world, at times having an inventory of nearly 4,000 planes. The planes are either damaged, in various stages of disrepair or nearly ready to fly. While many will end up being scrapped, they also are salvaged for parts and even used by the Air Force for target practice. The KC-97 has a wingspan of 141 feet and was 39 feet 4 inches tall and could carry between 9,000 and 15,000 gallons of fuel, depending on the model. It would carry a crew of five. In various configurations, it survived in service into the Vietnam War. The building, which has a total of 2.2 million square feet on three levels, was built in 1942 by the federal government to supply the war effort. It was operated by the General Motors Corp. to build the Boeing Co.-designed B-29, which was used mostly for fighting the Japanese over the Pacific Ocean. But, said Perrien, whose father worked in the plant, the government decided that final assembly was taking up too much manufacturing floor space so final assembly was done at a plant in Wichita, Kan. The Cleveland plant was used to make parts and to build and assemble wings and the tail rudders. The plant employed as many as 15,000 at its peak, according to the Encyclopedia of Cleveland History. The Cleveland Bomber Plant, or Fisher Body Aircraft Plant No. 2, as it was more formally known, was turned over to GM’s Cadillac division in 1950, as the Korean War was heating up, to build tanks. The Cleveland Tank Plant, as it became known, operated until 1960, producing tanks and a variety of other heavy military vehicles until 1972. The building was purchased by Park Corp. in 1977 and turned into the International Exposition Center, as it was formally dubbed. Perrien said he’s still working out the best way to take advantage of the plane. The center has 17 major events annually and many smaller trade shows, conferences and other events, some with transportation or military themes. Among the major attractions are the annual Cleveland International Auto Show, The Great Big Home & Garden Show and the Ohio RV Supershow. Earlier this year, the Military Vehicle Preservation Association held its annual conference at the I-X Center. Perrien said he thinks it might end up being flanked by a bar and restaurant, though it will be movable. “We have four hangar doors 150-feet by 152-feet and it will have foam-filled tires, so we could push it outside,” he said. Why not restore it to flying condition and truly save an aircraft? If you have that kind of money, invest properly and make history!